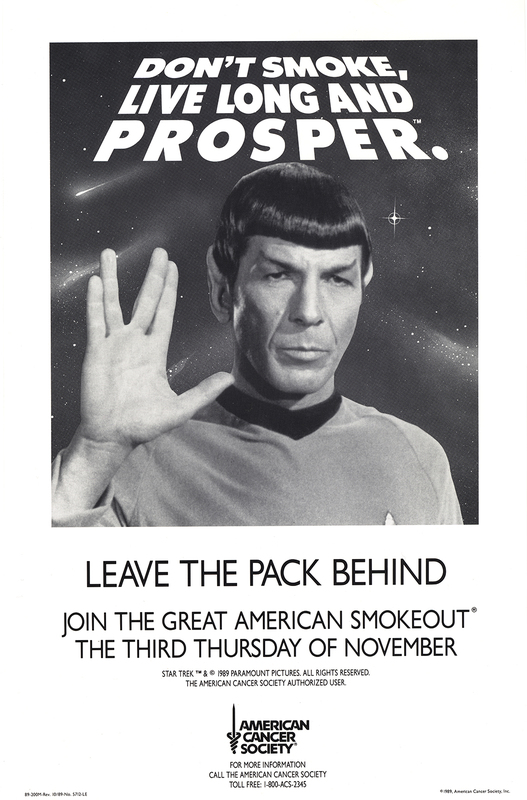 This 1989 poster from the American Cancer Society (ACS) features pop culture icon Leonard Nimoy, as his character Mr. Spock from the television series Star Trek, urging the public not to smoke. This poster was created in observance of the annual Great American Smokeout, which occurs on the third Thursday of November. Sponsored by the ACS, the Smokeout seeks to encourage smokers to quit, or make a plan to quit smoking by the day of the event. The first Smokeout event took place in San Francisco in 1976, a time when smoking was prevalent and the long-term dangers of smoking were not widely acknowledged by the public. Sparked by an event in 1970 at which people were asked to give up cigarettes for a day and donate the money they would have spent on cigarettes to a high school scholarship fund, the California Division of the American Cancer Society got nearly 1 million smokers to quit for the day. This California event marked the first “smoke out” and the Society took the program nationwide in 1977. Since then, dramatic changes have occurred in the way society views smoking and tobacco use, leading to such changes as smoking workplace restrictions, smoke-free restaurants, higher taxes on cigarettes, and limitations on cigarette promotions. Good news! It is now illegal to purchase cigarettes until age 21 in N Y C. That is the age of vulnerability to addiction, the strategy of the tobacco companies— get em hooked early and you have a customer for life; i e shortened life.